The new Craftsman 230-piece is indeed eye-catching because of its classic black color. It gives an impression that this tool set is made with quality and professionalism. You can easily carry it wherever you go because the case is very portable and handy. This is designed not only for professionals, but for home users as well. If you are looking for a tool that can handle most of your simple repairs and home-based tasks, then Craftsman 230-piece is just the right choice for you. It is versatile enough to be used for different projects; either it is light tasks or heavy duty ones. You will find it very easy to use because of its plain design. It is simple, but tough on application. This tool set includes a total of 230 pieces of hand tools in variety of shapes and sizes. Rest assured that it has all you’ll need for whatever task you may have in the future. If you need to tighten bolts, then you can use the wrench included. There are other applications that you can perform using this. You don’t need to worry because Craftsman ensures that you have a very durable tool set. All the tools enclosed are made from steel alloy. This material is tough enough to even work on hard metals. Rest assured that you can use them for longer period of time. Compared to other tool set in the market, the Crafstman 230-piece has more variety and offers more versatility. This is the reason why many DIYers opt to use this mechanical tool set for their everyday repair needs. Another feature that you will surely love about Craftsman 230-Piece is the inclusion of 3 quick-release ratchets offered in standard drive sizes. You will find the compatible drives because this kit offers the commonly used sized of the consumers. Moreover, it includes expansion bars and joints in universal sizes for easy accessibility while you work. You can really get convenience out of this mechanical tool set. The sockets are given in different points to suit your needs and requirements. You don’t need to be frustrated in finding the right socket point because it is already included in the package. The wrenches are also offered in six to help you accomplish a task if ever the ratchet won’t do. Another tool that you can find is the magnetic handle with 12 nut drivers. These tools will surely give you enough power to work on hard-to-handle mechanical tasks. Durable Steel Alloy Tools – the tools are made from steel alloy that is known to be such a very tough material for tools. Two extension bars with Universal Joint – these inclusions allow you to increase your reach while you are working. It gives you easy access to some hard-to-reach areas and surfaces. 6 combination wrenches – It will surely give you power and versatility to most of your tasks. Magnetic handle – this handle has 12 nut drivers for effective tightening of nuts and bolts. 4p pieces of hex keys – used for driving nuts and bolts in hexagonal sockets. We award a rating of 8 out of 9 for the Craftsman 230-piece for its remarkable performance when it comes to variety of applications. This is surely the best for your money because you get to have many tools in one set, and for a great price. Everyone could avail it because it is offered with a reasonable tag. 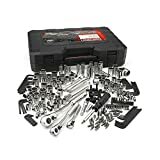 Most of the users commended this tool set primarily because of the inclusion of durable steel alloy wrenches that are commonly used in home applications and other projects. They are very satisfied because everything that they’ll need is included in the set already. If you are looking the finest for your home applications, then this is the time to avail it. The Craftsman 230-Piece is a remarkable tool set; however, it would be better if the wrenches will be offered in different sizes. Some of the users noted that the wrenches are too small to be used for their project. Nevertheless, it is still a recommended mechanical tool set for both professionals and home users. The Craftsman 230-Piece should be included in your list if you are searching for a tool set that contains almost everything that you’ll need. You will surely appreciate the inclusion of additional tool in this set to add more to its versatility. You can consider this as the best mechanical tool set for the money. You can also check out the reviews section for more insights and feedbacks.